A trial date has been set to adjudicate the charges of Driving While Intoxicated levied last year against University of Texas junior outside hitter Micaya White. Her case will be heard by a jury trial on January 14th, 2019, after the conclusion of the 2018 NCAA season. White was arrested in March of 2017 in Travis County (where Austin is located) on suspicion of driving under the influence of alcohol. She was originally pulled over around 2:05 AM for not having her headlights on and following another vehicle too closely. White admitted to having two vodka shots around 8PM, but police reported that she failed a field sobriety test and smelled of alcohol. No breathalyzer test was administered. She was released on $2,500 bail after staying overnight in jail. After a number of pre-trial conferences and activities, a jury trial date was set in the case last week. A first offense for DWI in the state of Texas carries penalties that include a fine of up to $2,000, a jail sentence of up to 180 days, and loss of drivers license for a year. White leads the Longhorns this season with 137 points (3.57 kills/set, .46 blocks/set) and his hitting .291. She was named a 2017 AVCA All-America Third Team Member, and was a member of the 2017 USA Volleyball Collegiate National Team that played in Thailand this summer. White started all 30 Longhorn matches in 2017 after the arrest; that’s in spite of the fact that a year earlier, the school suspended Texas football player Kent Perkins for 1 game after a DWI arrest. According to the CDC, Texas had more drunk driving deaths between 2003-2012 (13,138) than any other state in the country. 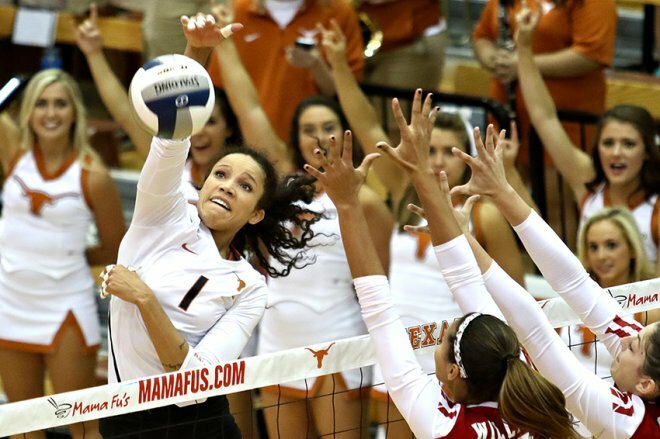 Texas, ranked #6 in the latest VolleyMob Power Rankings, will face #12 Baylor at home on Wednesday.